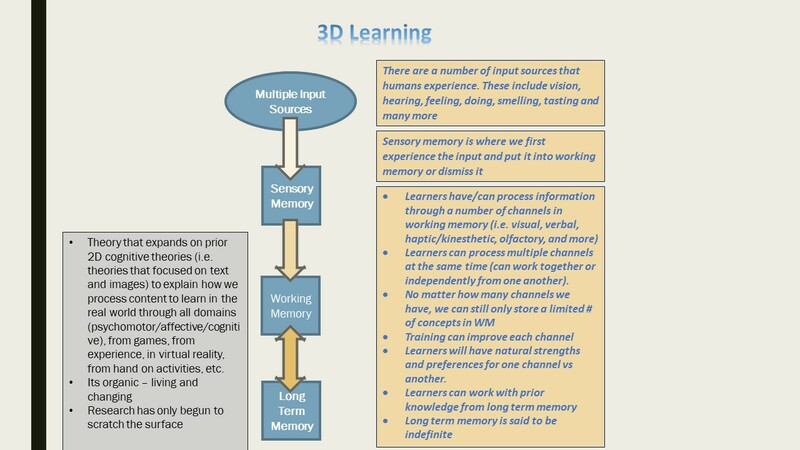 1.0 What is 3D Learning? Theory that expands on prior 2D cognitive theories (i.e. theories that focused on text and images) to explain how we process content to learn in the real world through all domains (psychomotor/affective/cognitive), from games, experience, virtual reality, hand on activities, etc. Memory has 3 parts – sensory, short term, and long term. Short term/Working Memory – This is where information is processed. Long term memory – indefinite storage capacity. Information can be stored here and retrieved for later use in working memory. Working memory is composed of two channels – verbal and nonverbal (visual). Each channel can function independently or they can work together to use information or store it in long term memory. (3) that learners engage in active processing. How does any of this account for real hands on learning? Gaming? Virtual reality? Where we use other means of learning besides images and words (narration). Much of our learning combines all domains of learning. Psychomotor and affective tasks require cognitive resources (i.e. are using in working memory). The domains of learning are great for instructional strategy development but do not help explain what happens in working memory. Then I started finding things like this from Quak, et al (2015) who says that we tend to look at the way we process information in a stationary fashion, examining 1-2 channels at a time (i.e. text and images) whereas in real life we take on many at a time – hearing, smell, sight, taste, etc. For example, when we play a video game we are using our ears, eyes, and hands. So I started looking at the biology of humans. Specifically focusing on the senses and found that biologists recognize many senses (20-30 or more) such as Visual, Auditory, Haptic/kinesthetic, Olfactory, etc. I was surprised, but yes, we have many other senses. More than the standard 5 many of us learned in grade school. For example, hunger and thirst. Our body has a lot of senses. Andrade and Donaldson (2007) conducted a series of experiments that found that there was a modality specific space in working memory for a learner’s olfactory system. These results were then again confirmed by Jonsson, et. al (2011). Lerch, Cui, Patwardhan, & Visell (2016) conducted an experiment which found that haptic information can be stored in working memory and has its own channel. Seaborn, Riecke & Antle 2010 found similar results. So we have some initial evidence that these senses have their own place in working memory! Now this makes sense. The research is aligned to what we really experience. This explains what is happening in working memory when we learn from games, virtual reality, and in the real world! Now I am excited! 4.0 What I realized is that we have been focusing on a very small piece to a very large puzzle! 3D Learning is a theory that expands on prior 2D cognitive theories (i.e. theories that focused on text and images) to explain how we process content to learn in the real world through all domains (psychomotor/affective/cognitive), from games, from experience, in virtual reality, from hand on activities, etc. Learners can process multiple channels at the same time (can work together or independently from one another). Training can improve each channel. Learners will have natural strengths and preferences for one channel vs another. What are the other channels/how many? Olfactory, haptic/kinesthetic, taste, etc. How many do we have? What combinations work best? How many is too many? For example, using our eyes, ears, and hands. Is that too many? How does that impact cognitive load? Andrade J. & Donaldson L. (2007). Evidence for an olfactory store in working memory? Baddeley, A. (2012). Working Memory: Theories, Models, and Controversies Annu. Rev. Psychol. 2012.63:1-29. Baddeley, A. (2000). The episodic buffer: a new component of working memory? Trends in Cognitive Sciences, 4(11), 417-423. Jonsson, F., Moller, P., & Olsson, M. (2011). Olfactory working memory: effects of verbalization. Memory and Cognition, 39, 1023-1032. Lerch, R., Cui, H., Patwardhan, S., & Visell, Y. (2016). Exploring haptic working memory as a capacity-limited information channel. Presented at the IEEE Haptics Symposium Conference. Mayer, R., E. (2005). Introduction to multimedia learning. In R. Mayer (Ed. ), The cambridge handbook of multimedia (pp. 1-16). NY: Cambridge University Press. Paivio, A. (1971).Imagery and Verbal Processes, Holt, Rinehart, and Winston, New York (Reprinted 1979, Erlbaum, Hillsdale, New Jersey). Quak, M., London, R., & Talsma, D. (2015). A multisensory perspective of working memory. Frontiers in Human Neuroscience. 9, 1-11.